Cheery pollen-free blooms are dazzling in mass plantings and make for stunning cut flowers. 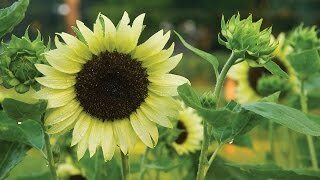 Meet the big new star of dwarf sunflowers, the naturally compact hybrid sets a new standard for dwarf sunflowers—and is the smallest to be found. Early-blooming, super floriferous plants produce a prodigious number of bicolor 5-6 inch flowers with gold petals surrounding a black eye: up to 20 blooms a plant. After first flowering, plants produce up to three waves of 5 to 8 flowers, providing continuous color all summer. Dazzling in mass plantings and brings a burst of saturated color to the patio container. Cheery pollen-free blooms make for stunning cut flowers.